U.S. Rep. Jim Langevin declared his candidacy for reelection to Congress Tuesday morning, handing in papers at the secretary of state’s elections office. 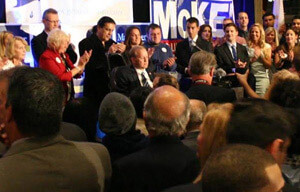 Langevin said the issues he will campaign on are familiar to those who have followed his career: career and technical education, cybersecurity and national security, especially the construction of Virginia-class submarines, which are built in Quonset Point and in Groton, Connecticut, by General Dynamics Electric Boat. “These are the things that I continue to focus on,” he said, adding that he also hopes to gain ground on campaign-finance reform and gun safety. The secretary of state’s office said that at least two opponents have begun the process of getting on the ballot: Democrat Steven Archer and independent Salvatore G. Caiozzo. Also, Republican Rhue Reis said on June 9 that he would challenge Langevin. Langevin was elected to Congress in 2000, when Rep. Robert Weygand ran for the U.S. Senate. Langevin previously was a state representative and secretary of state. He represents Rhode Island’s Second Congressional District, which generally covers the state west of Narragansett Bay, except for parts of Providence and several communities in or near the Blackstone Valley. Not long after Langevin declared his candidacy Tuesday morning, the Coventry Democratic Town Committee announced that it had endorsed Langevin at its meeting Monday night. Several weeks ago, the state Democratic Party endorsed Langevin at its state convention. Jim Langevin will officially launch his reelection campaign for Congress on Tuesday morning. Langevin, who is pursuing a ninth term to represent Rhode Island’s Second Congressional District, will file his Declaration of Candidacy at 10 a.m. tomorrow at the Rhode Island Secretary of State Elections Division in Providence.